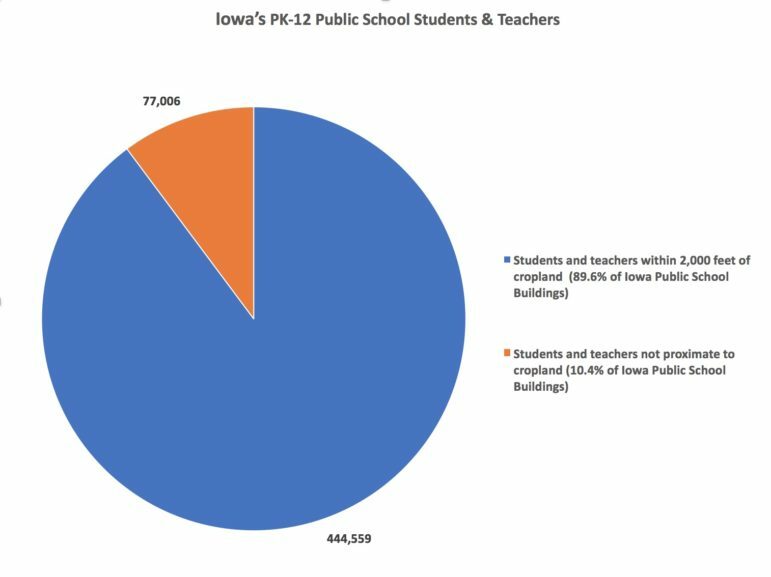 Nine of every 10 public school districts in Iowa have buildings within 2,000 feet of a farm field, making students and teachers susceptible to being exposed to pesticides that drift from the fields when pesticides are sprayed. Yet many school officials interviewed for an IowaWatch/Tiger Hi-Line investigation showed little to no awareness on if or how pesticide drift could affect the staff and students in school buildings. “You know, I hadn’t even thought of that,” Kim Cross said. Cross is wrapping up as Cedar Falls Community School District Southdale Elementary principal before becoming principal at the new Aldrich Elementary in Cedar Falls that is to open the fall 2018. “That was just something that I had heard recently that was a concern of someone,” she said. A journalism study by Science in the Media, a University of Northern Iowa project, showed that 89.6 percent, or 1,183 of Iowa’s 1,321 K-12 public schools, are within the range of accidental spraying and spray drift. IowaWatch, a nonprofit news organization, and the Tiger Hi-Line, are media partners with Science in the Media, which provides IowaWatch with financial support to collaborate on journalism projects. With close to 1,200 schools, or 33.5 percent of all schools, being adjacent to the fields and in range of sprayings, 444,559 students and teachers are at risk to exposure and health concerns associated with pesticide exposure. Louis Beck, an agriculture teacher at Union High School in La Porte City, Iowa, one of those schools adjacent to farmland, said a lack of buffer zones between public buildings and farm fields for pesticide application on the farm fields worries parents and faculty he knows. 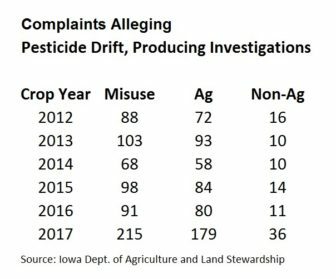 The Iowa Department of Agriculture and Land Stewardship reports 589 agriculture-related pesticide misuse complaints from 2012 to Aug. 1, 2017. But an agriculture department Pesticide Bureau staff review of records for IowaWatch and the Tiger Hi-Line showed only one of those alleged pesticide drift from a neighboring property to school grounds from crop year 2006 to crop year 2017, which ended Sept. 30, 2017. That complaint was dismissed after an investigation indicated that no pesticide application took place, agriculture department communications director Dustin Vande Hoef wrote in an email. The complainant mistakenly thought anhydrous ammonia was a pesticide, Vande Hoef wrote. A pesticide is any chemical applied to crops to eliminate animals, insects, weeds or fungi that may harm crops. Spray drift can occur in two different ways: during application or by volatilization. Volatilization occurs when pesticides evaporate and rise into the air in a gas form. Even if pesticides can’t be seen physically, they can be harmful. When applied, the chemicals can be carried by the wind to points away from the intended application site — the process known simply as “spray drift.” The drift can then come in contact with other crops, animals, plants and even humans, in the form of “spray, vapor, odor or dust,” Iowa’s Center for Agricultural Safety and Health states. Land where the school is being built was purchased jointly in 2007 by the city of Cedar Falls and Cedar Falls school district. Nefzger said projected rapid population growth drove city planners to select the site, west of Hudson Road on Erik Road. More than 680 million pounds of pesticides are applied to U.S. agricultural fields each year, according to a report by the Pesticide Action Network, a Berkeley, California-based organization seeking limits to pesticide use. 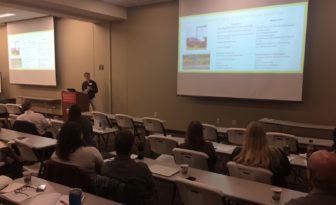 WATCH THE KWWL TV REPORT ON THIS STORY AND HOW STUDENT JOURNALISTS WORKING WITH IOWAWATCH AND SCIENCE IN THE MEDIA MADE IT HAPPEN. The National Academy of Science estimates that one-third of neurobehavioral disorders are caused directly by pesticides. In the United States, 15 percent of all children have one or more developmental disabilities. This shows a 17 percent increase when compared to the previous decade. Chemicals used when spraying pesticides also cause cases of neurodevelopmental disorder in approximately 400,000 to 600,000 of the four million U.S. children born each year, according to the Environmental Health Perspectives. Although pesticides are not the only cause of developmental disorders, according to the Pesticide Action Network, public health experts agree that the chemicals used in pesticides can trigger disorder side effects if the child has been exposed to pesticides over a certain period of time. A published study, “Proximity to Crops and Residential Exposure to Agriculture Herbicides in Iowa,” in the journal Environmental Health Perspectives stated that houses closer to pesticide-treated farms were found to have more pesticide-related chemicals than other houses in their communities. “We collected dust samples and compared them to see the amount of pesticide exposures, and we saw higher amounts of exposure in houses closer to farm fields,” John R.Nuckols, emeritus professor of environmental and radiological science at Colorado State University, said. Only 18 percent of U.S. states require buffer zones between schools and farms, but Iowa isn’t one of them. Iowa Sen. David Johnson, I-Ocheyedan, said Iowa’s agriculture industry has power to prevent change to regulations about pesticide use. “Industrial agriculture has its grip on this Legislature. I’ve seen that before, and that generally stifles regulatory consideration when you have a legislature like it is now,” Johnson said. State Rep. Norlin Mommsen, R-DeWitt, who rents a family farm near Clinton, Iowa, called Mommsen Farms, said labels on pesticide containers provide sufficient regulation for applicators. “If you look at a label of any herbicide, it already talks about wind speed, if you need a setback or a buffer area and all those things are already there. That has nothing to do with legislation. That has to do with the manufacturer and the government,” Mommsen said. Rob Faux, an organic farmer near Tripoli, Iowa, since 2004, has been directly hit by pesticide spray drift and said more than just labels is needed. 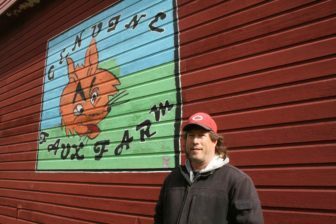 Chemicals sprayed from an airplane landed on Faux’s organic crops and pastures, some of the turkeys and laying hens and on Faux himself. 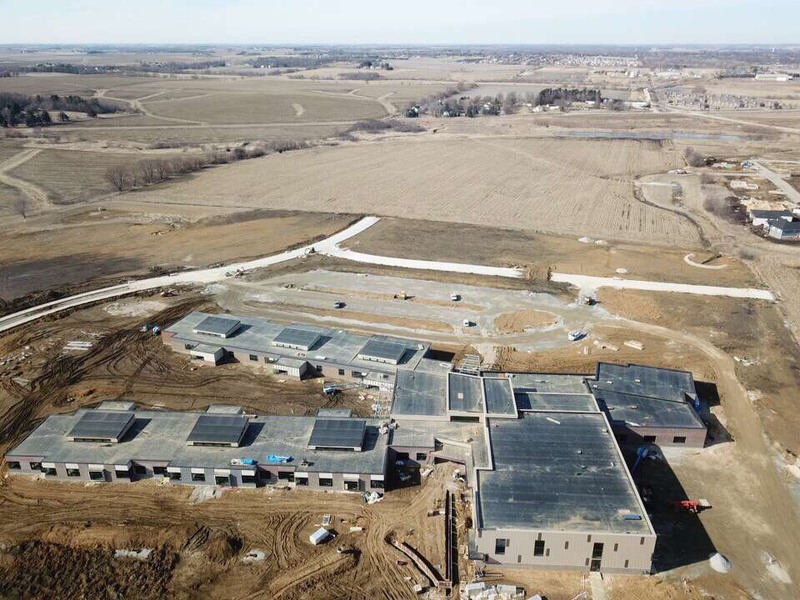 Pam Ziegler, director of elementary education for the Cedar Falls school district, said urban growth along the west side of Cedar Falls will continue to increase at such a rapid rate that she has no concern of potential spray drift toward the new elementary school and its effects. On the west side of Aldrich Elementary, for example, city-owned land eventually will be developed into a park area for the school, she said. Cedar Falls’ school district does not have a formal response plan if exposure to spray drift at a school, something which has not happened at a Cedar Falls school. “I think about the only thing the district could do is to bring that concern up to the landowner,” Nefzger said. “I know that the gentlemen that owns that property also owns other properties adjacent to residential developments in the community, so I can’t imagine that he would not be sensitive to our requests,” he said. Elise Leasure, Saba Aydiner, Chase Kline, Tehya Tournier and Ben Boezinger contributed to this report. This IowaWatch story was republished by the Courier (Waterloo, IA), The Tiger Hi-Line and the Science in the Media website and a report on this story and how it came about was broadcast by KWWL of Waterloo (IA) under IowaWatch’s mission of sharing stories with media partners. Watch the full KWWL report at at this link. 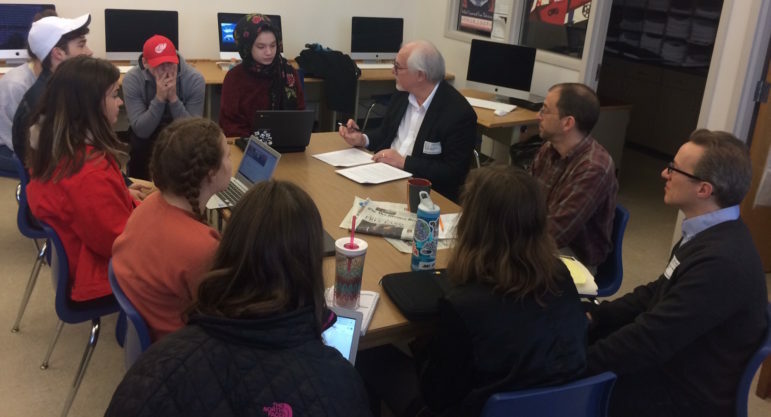 IowaWatch Executive Director-Editor Lyle Muller (center) talks on Tuesday, April 3, 2018, with Cedar Falls High School Tiger Hi-Line student journalists about a story they are working on for publication later in the month. Right of Muller in the photo is Brian Winkel, Tiger Hi-Line adviser and journalism teacher; and Christopher Martin, University of Northern Iowa professor of communication studies and digital journalism. The 2018 IowaWatch/Tiger Hi-Line project is part of a Science in the Media project in which IowaWatch and UNI are collaborating.